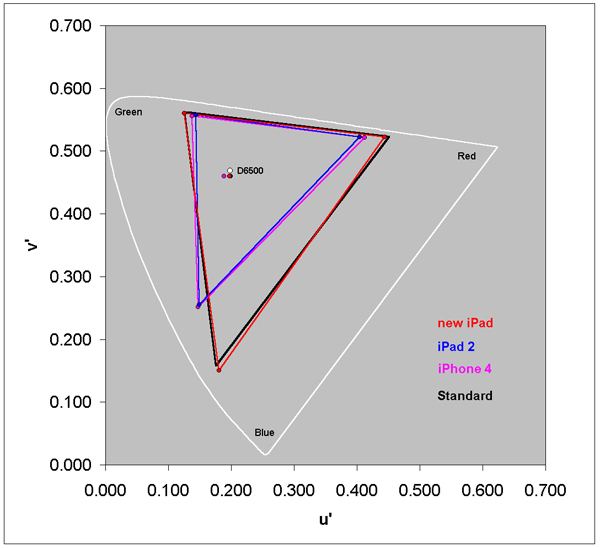 Figure 2 shows the measured Color Gamuts for the new iPad, iPad 2 and iPhone 4 along with the Standard Color Gamut in black. The outermost white curve is the limits of human color vision - the horseshoe is the pure spectral colors and the diagonal is the Line of Purples. A given display can only reproduce the colors that lie inside of the triangle formed by its primary colors. Highly saturated colors seldom occur in nature so the colors that are outside of the Standard Gamut are seldom needed and are unlikely to be noticed or missed in the overwhelming majority of real images. Note that consumer content does not include colors outside of the Standard Gamut, so a display with a wider Color Gamut cannot show colors that aren't in the original and will only produce inaccurate exaggerated on-screen colors. The dots in the center are the measured color of White for each of the displays along with the D6500 Standard White, which is marked as a white circle. To deliver accurate image colors for consumer photo and video content the display must match the Standard Color Gamut and the Standard Color of White. Note that too large a color gamut is actually visually worse than too small a color gamut because that produces gaudy colors that are over-saturated. The iPad 2 and iPhone 4 have a reduced Color Gamut due to weak Red and Blue primaries that result from the White LED Backlighting. It's an intentional tradeoff made to increase screen brightness, power efficiency and battery run time. Note that image Reds, Blues and especially Purples will be weak and undersaturated, which may introduce a greenish caste into the image. The new iPad corrects these deficiencies and has a much larger Gamut that is an excellent match to the Standard so it can produce accurate colors as long as there is also an accurate Standard White Point and Standard Intensity Scale.